Soundpool works very closely with a wide variety of performing, visual, and media arts facilities. Our experienced team understands the complexity of operating and programming arts facilities. 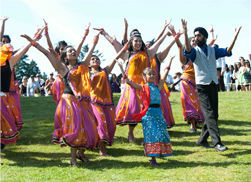 Recent projects include strategic and operational planning for the concert hall of the Aga Khan Museum, an extensive market demand analysis and programming plan for a new multi-purpose performing arts theatre in Vancouver and a community consultation/needs assessment for the City of Surrey’s new performing arts centre. Soundpool has designed, developed and operated large-scale seasonal festival facilities and site-specific venues for the Vancouver International Jazz Festival, the Vancouver 2010 Cultural Olympiad and Vancouver 125, as well permanent indoor and outdoor festival sites in Burnaby and Vancouver.